Our Ecology team are gearing up for a busy newt survey season this Spring, to support our clients wherever Great Crested Newts are present on site. The Great Crested Newt is legally protected in the UK and is an important consideration for a range of development activities and conservation initiatives. We will be conducting Great Crested Newt surveys over the coming months, as the survey season for this species is very limited (March – June). Early season planning of surveys is very important to ensure they run smoothly. Great Crested Newts generally feed on a variety of aquatic invertebrates, but will occasionally tackle large prey items, including dragonflies and sometimes even other newts! They are mostly active at night and are rarely seen during the daytime, preferring to hide in mud or vegetation on the pond bottom. Around August, Great Crested Newts leave their ponds and live on land, sheltering under rocks and logs and occasionally emerging to forage during warm spells. We conduct surveys throughout the UK via all accepted methodologies including torch surveys, bottle trapping, refuge searches, netting, egg searches and the newly approved eDNA method. This eDNA method is advantageous in reducing survey effort required, increasing accuracy of results and providing significant efficiencies and cost savings to clients. Due to their legal protection, surveying for Great Crested Newts in the UK requires a licence from Natural England. 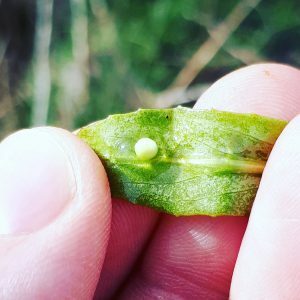 Junior staff will therefore be undertaking a training course run by our Senior Ecologist Rob Harrison, to get them up to speed on the latest techniques and on their way to attaining their survey licences. 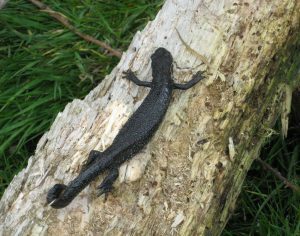 Email Rob Harrison for more information on Great Crested Newts and advice on the correct approach to Great Crested Newt surveys for your sites. You can also find out more on our ecology web page. Are you attending the River Restoration Conference on 24-25 April? We’ll be showing you how our catchment and river restoration team deliver innovative and sustainable solutions to improve our rivers and catchments. Our exhibition stand will be showcasing the JBA Trust’s augmented reality sandbox which demonstrates flood protection measures and scenarios. We are also giving four presentations and have eight posters for you to see our project examples. Read the abstracts to find out more in our interactive guide below. Just gone into garden and moved my watering can and found what looks like a Great crested nuwt. Hi John, thanks for getting in touch. You do need to be careful when putting the watering can back so as not to squash it but essentially leaving it alone is the right approach. If you cannot ensure replacing the water can won’t cause damage, you should cover the newt over to keep it moist and out of the sun and, hopefully, it should move away overnight. It will be looking for somewhere to hibernate round about now.